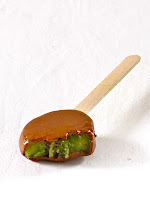 Plateful: Chocolate Covered Kiwis on a Stick — boost your intake of antioxidants with this fun recipe! 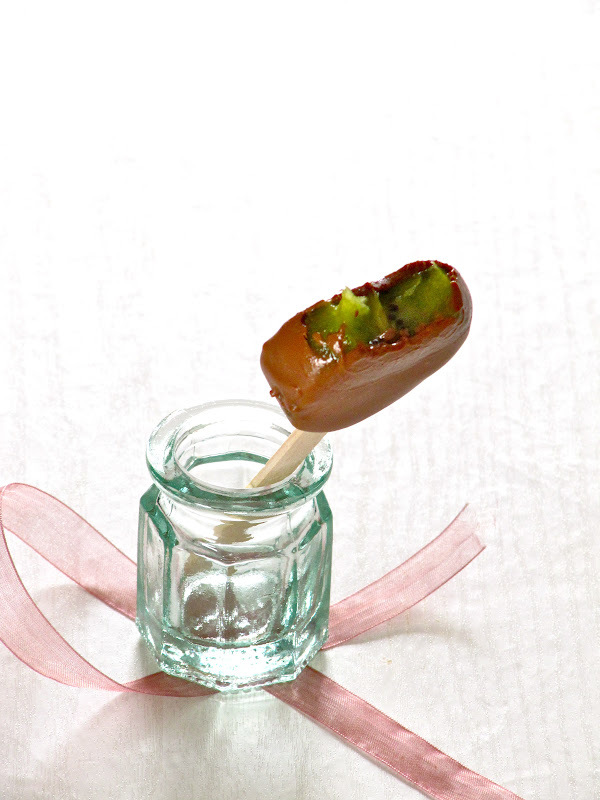 Chocolate Covered Kiwis on a Stick — boost your intake of antioxidants with this fun recipe! Mid April. Monday. Sunny day. 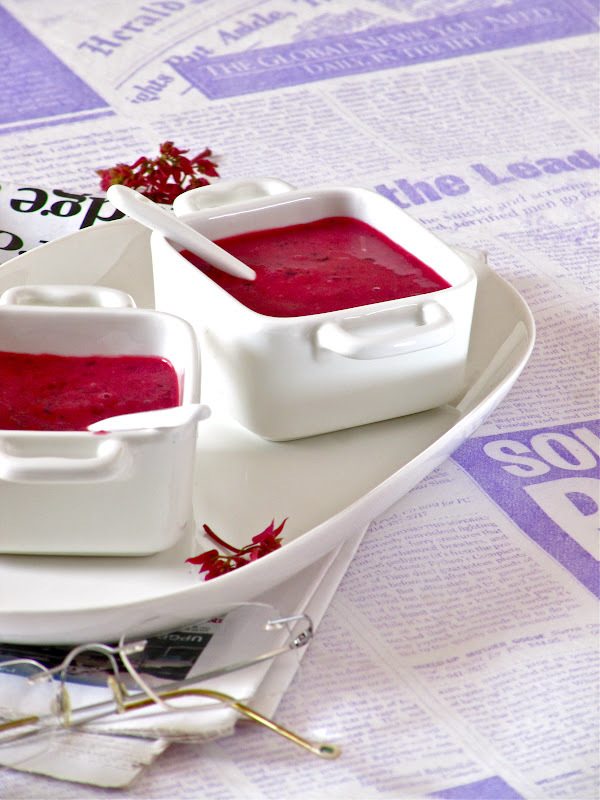 It’s time for a stunningly simple, yet gourmet-looking recipe peeps. 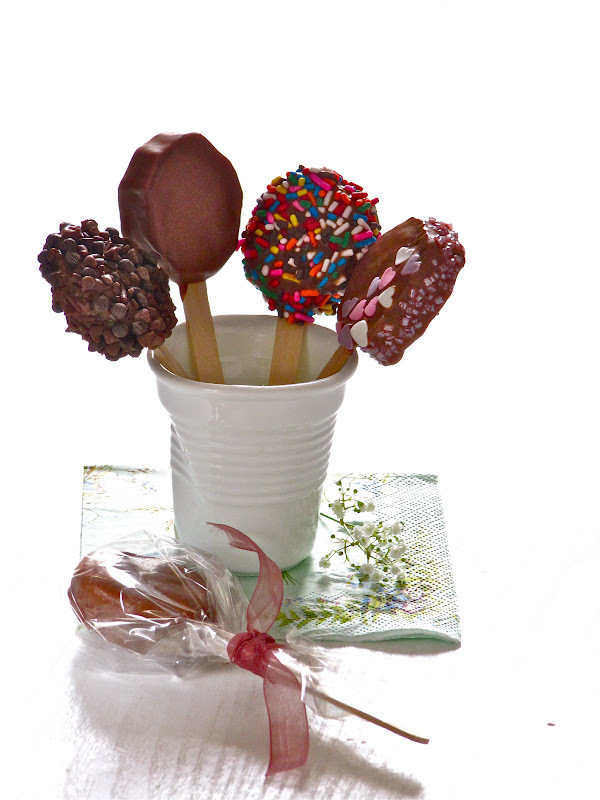 Don’t you love the idea of food on a stick? I do. 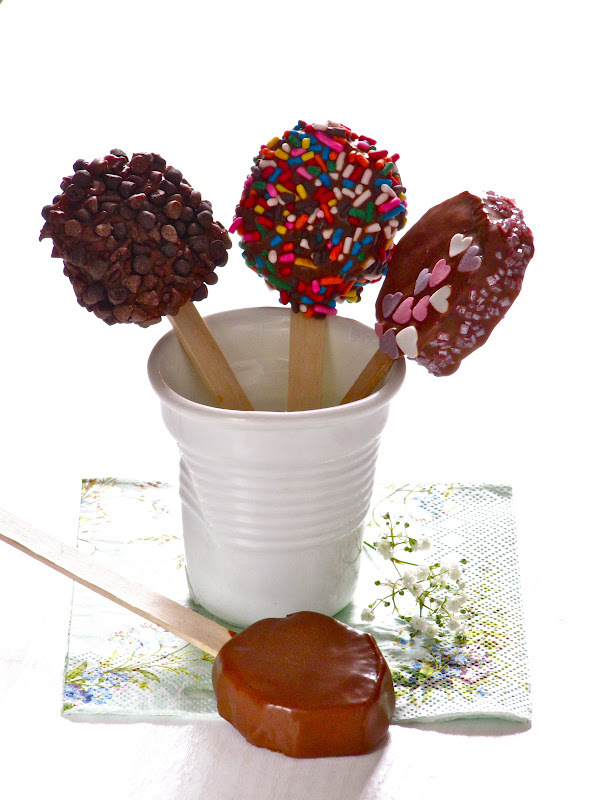 And my kids simply adore cute little morsels on a stick. Especially sweet treats. 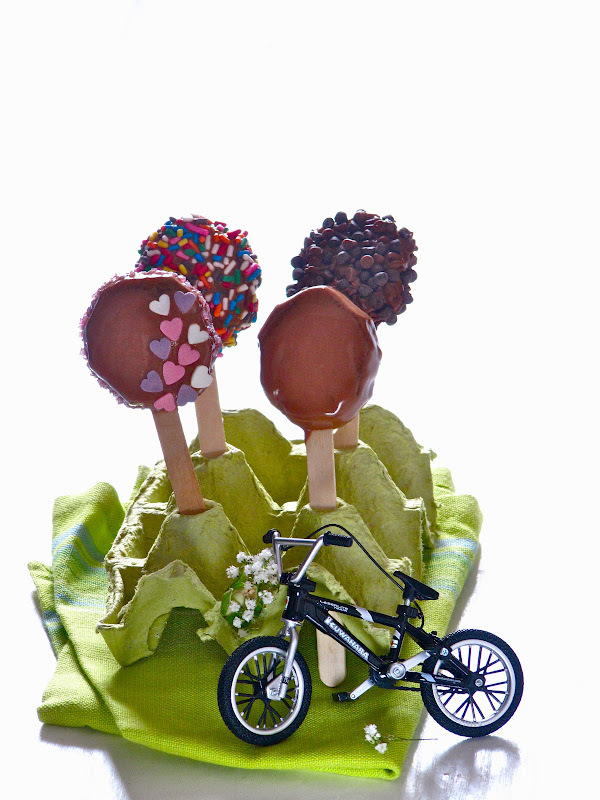 Cake pops, popsicles, fudgesicles, lollipops, or just about anything sweet that can be popped on a stick—you name it. No messy hands, or fuss with plates. They are so much fun to eat, and even more fun to make. 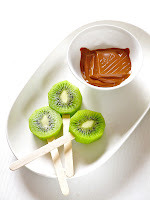 I’m sure many of you are familiar with the idea of serving kiwifurits on a stick. Chocolate covered kiwi goodness on a stick, that is. You have probably seem them around before on food blogs, or pinterest. Last week, when I was having a little fun with these terribly cute treats, I couldn’t help taking some pictures to share with you. Initially, I thought of posting the recipe to my facebook album, Make It Tonight. On second thought, I decided this deserved a blog post. Speaking of fb, do check out the recipe for Summer Fruits Frosty on my fb page. Cool, tangy, frosty flavors, with the added bonus of antioxidant from summer fruits, and calcium from yoghurt, and oh it’s scoopable too. 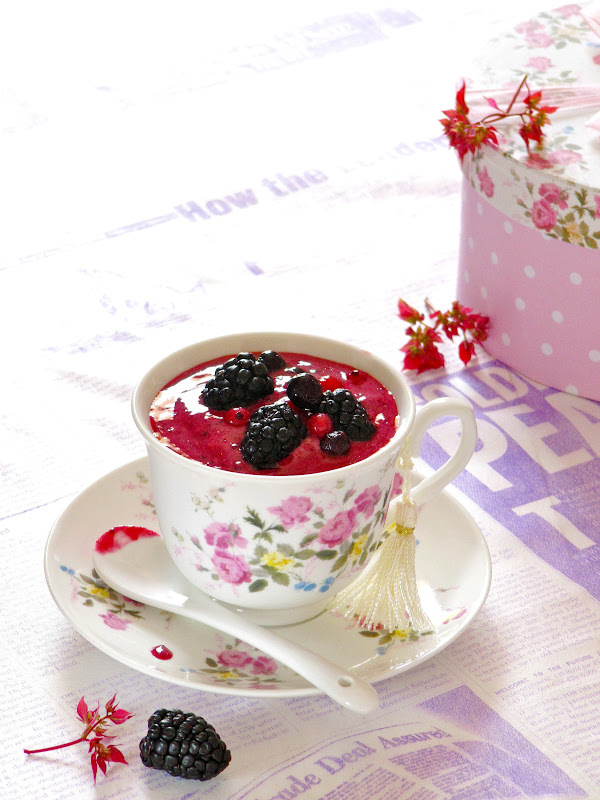 With warmer weather on the horizon, this is ideal for a quick breakfast. Here are some pictures for you to see. 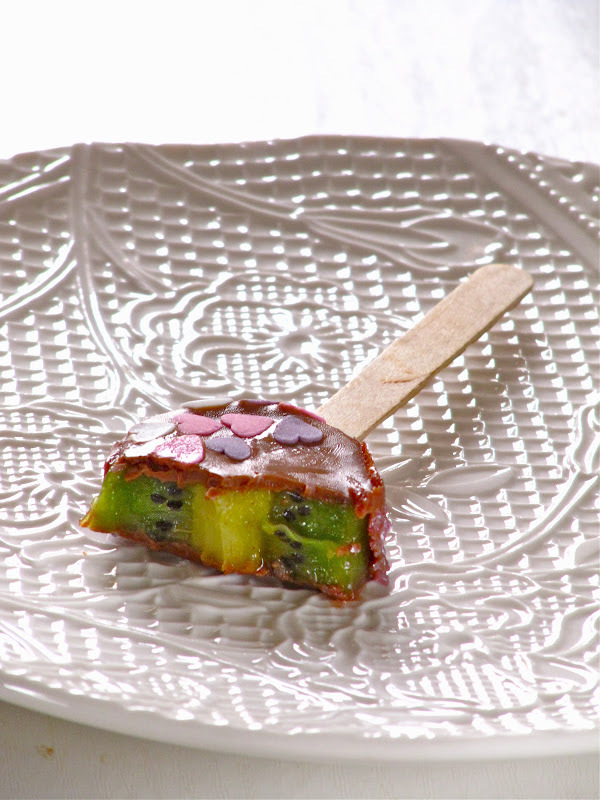 Now back to kiwi pops, or kiwi fondue. The recipe is easy breezy. And so much fun to put together—particularly if you are in the mood to play. 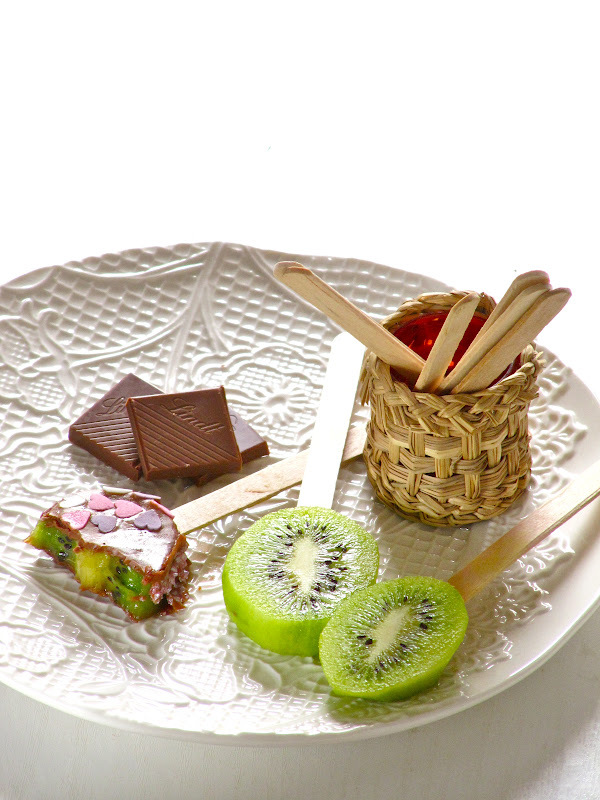 All you need is few slices of kiwifruit, popsicle sticks, melted chocolate and a bit of fat to add more shine to the chocolate coating. For extra personality, decorate each pop with individual toppings like rainbow or heart sprinkles, finely chopped nuts, shredded coconut, or nonpareils. 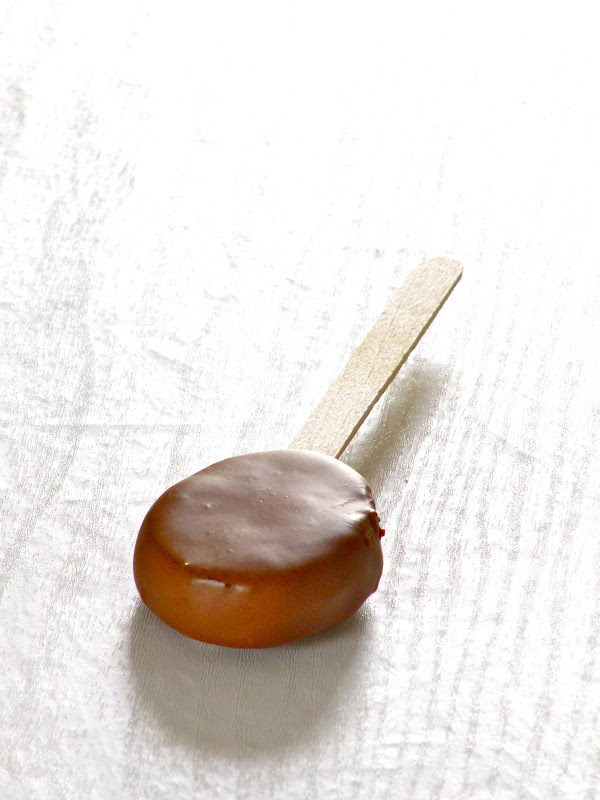 Or, forget the topping, simply enjoy them with the chocolate coating. Kiwi slices + Popsicle sticks + Chocolate = Yummy little morsels! Can't go wrong with that. Right? 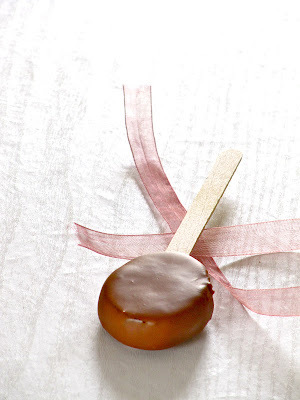 Serve these gourmet treats for your summer parties—it’s guaranteed to be a hit. 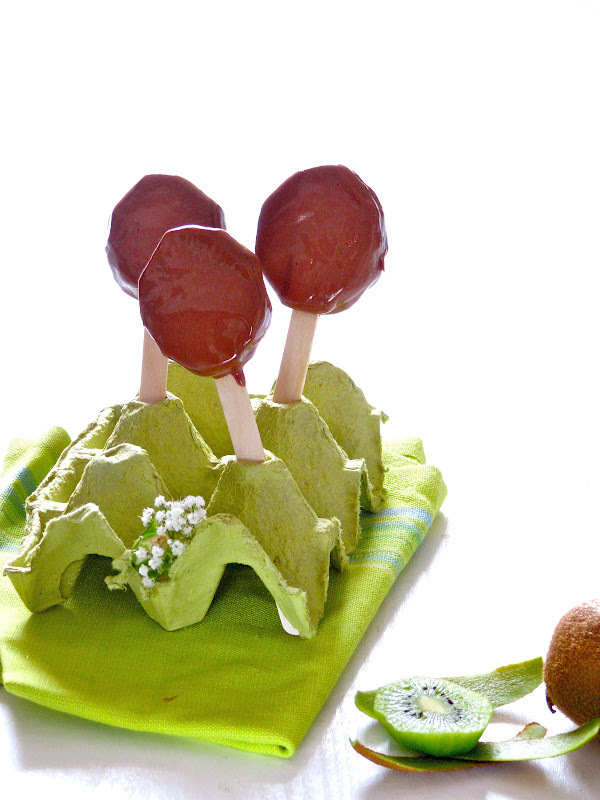 All your little peeps will not be able to resist kiwis when served up this adorably. And they taste pretty darn good. Did you know that kiwifruit is low calorie, nutrient dense, and an excellent source of dietary fiber, and antioxidant vitamins C and E? 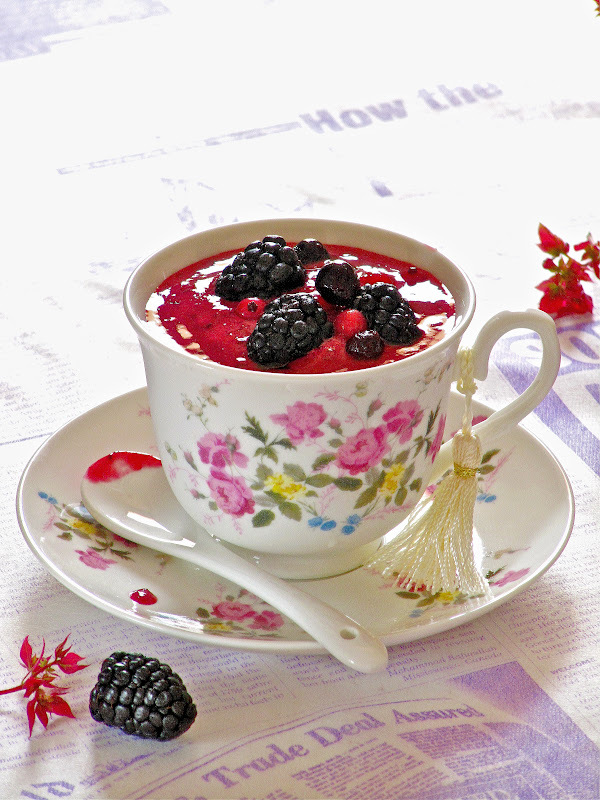 Combined with potent antioxidants from chocolate, this is a recipe with a feel-good factor—what more delicious way to boost your intake of antioxidants? For best results, choose ripened, but firm fruit. Place pops on styrofoam blocks to dry. Or better still, use an empty cardboard egg tray to hold the pops while drying. So, ready to play with your fruit? Then here we go! 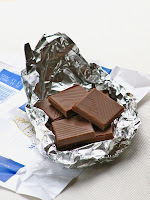 In a small, deep, clean (make sure the bowl is moisture free) microwave safe bowl, microwave the chocolate on high power for 30 seconds, then stir. Melt for another 30 seconds, stir. 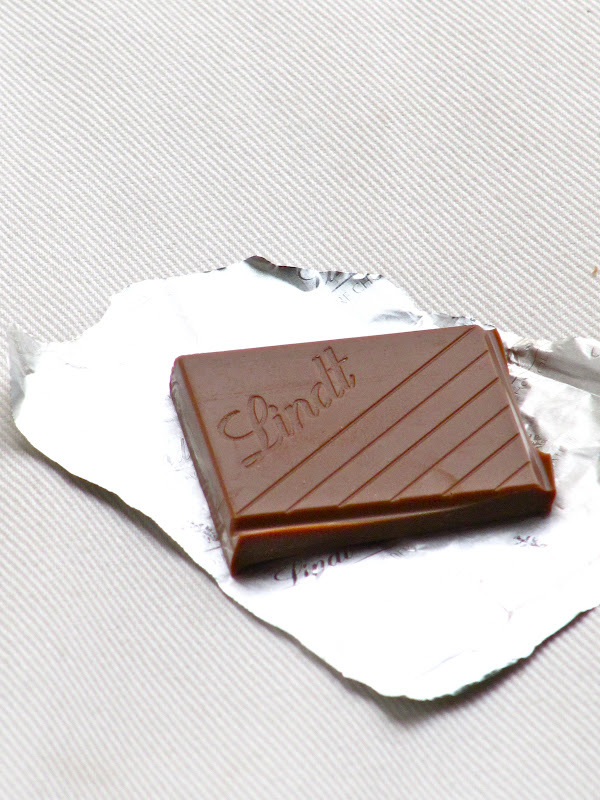 Repeat until chocolate is fully melted, smooth and shiny (mine was done in 1 minute). 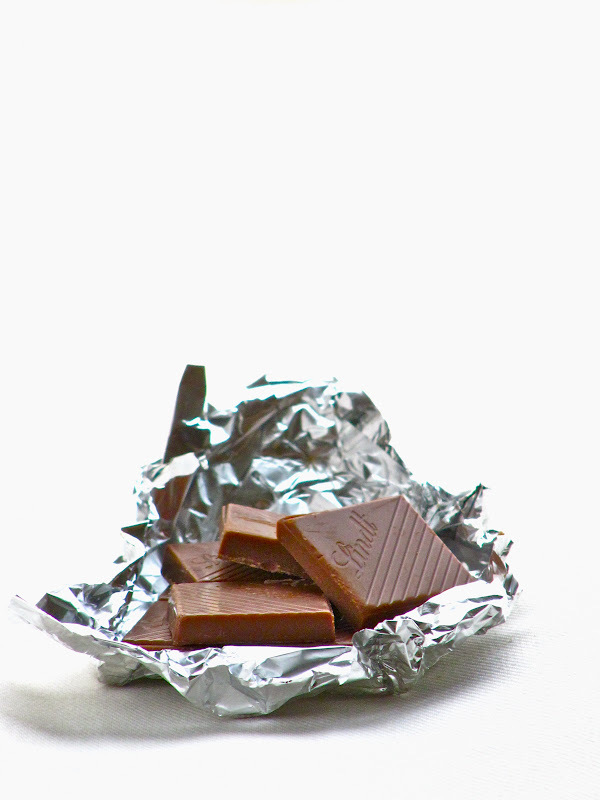 Take care not to over cook and burn the chocolate. And yes, use high quality chocolate for best results. Then stir in the fat—olive oil, or melted butter—and mix well. Meanwhile, insert sticks into the kiwi far enough to hold the fruit without piercing through the other end. 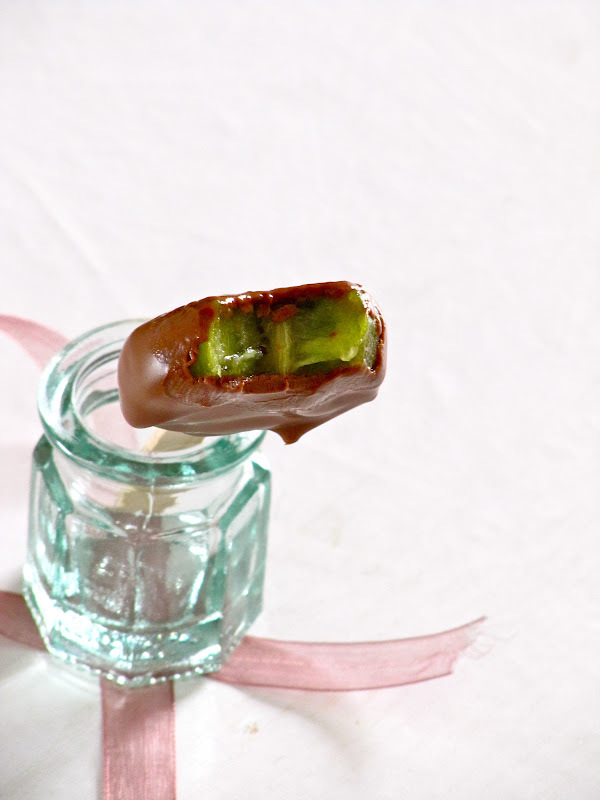 Dip the kiwi into the melted chocolate, making sure to coat all sides evenly. Gently swirl to spin off excess chocolate, and hold your hand up with the fruit pointing upwards, for about 2 seconds. Now it’s time for the finishing touches, if you like. Decorate each pop individually with toppings like rainbow sprinkles, nuts, coconut flakes, colored sugar, chocolate chips, jimmies—let your creative energy flow! 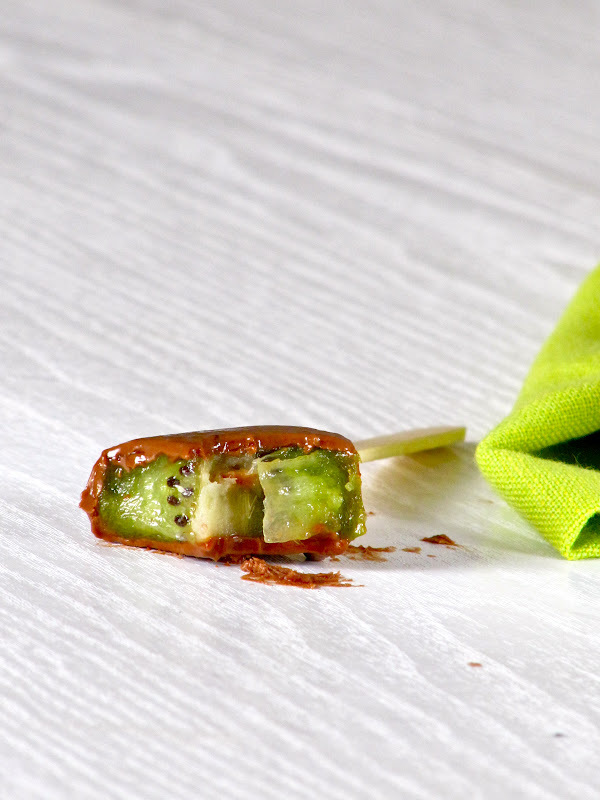 To coat the chocolate kiwi with toppings, sprinkling is the best way to go, rolling tends to clump the ingredients. Insert sticks onto egg tray, or styrofoam block, and leave to dry. This will take about 30 minutes, at room temperature. Chill it in the refrigerator for a couple of minutes to speed up the process. 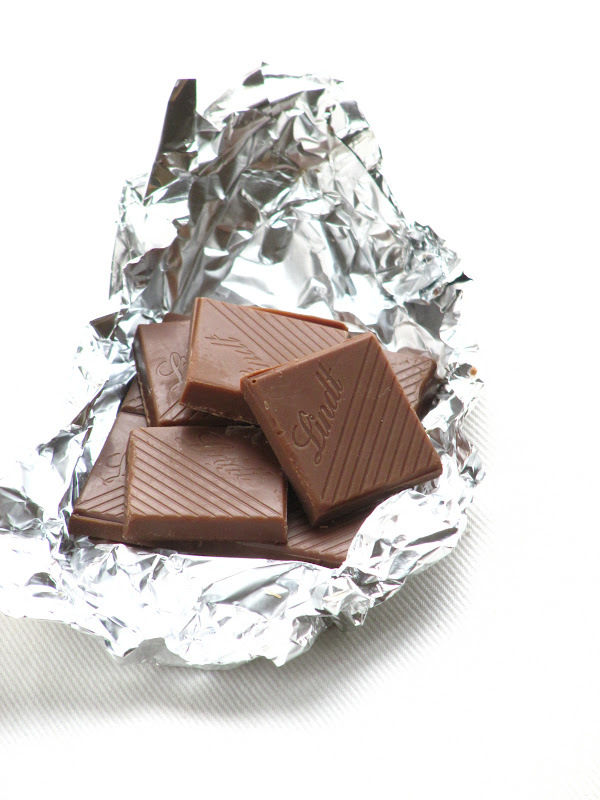 If you leave it in the fridge for long, the cold chocolate will "sweat" once taken out and left at room temperature. Serve immediately to avoid this. For an impressive presentation, wrap each pop in cellophane and tie with a ribbon. 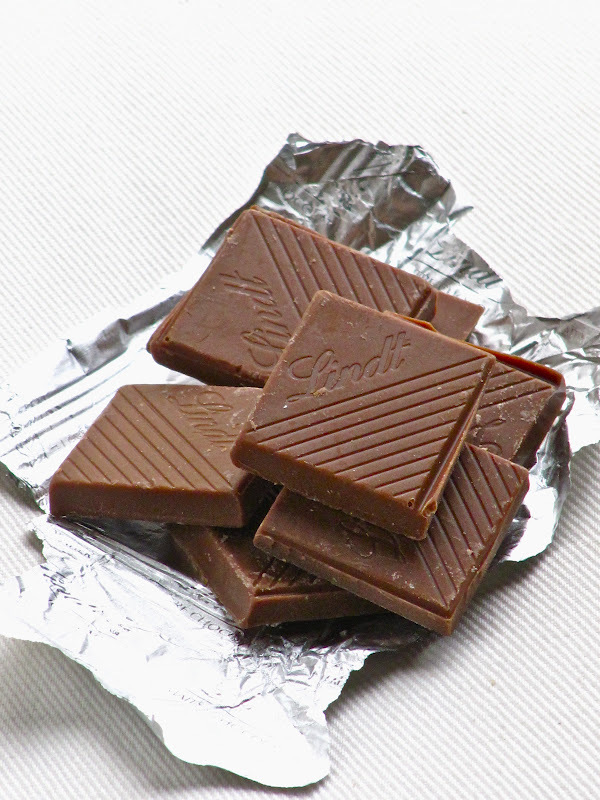 For variations, flavor your chocolate with a drop or two of vanilla extract, or a generous pinch of instant coffee. 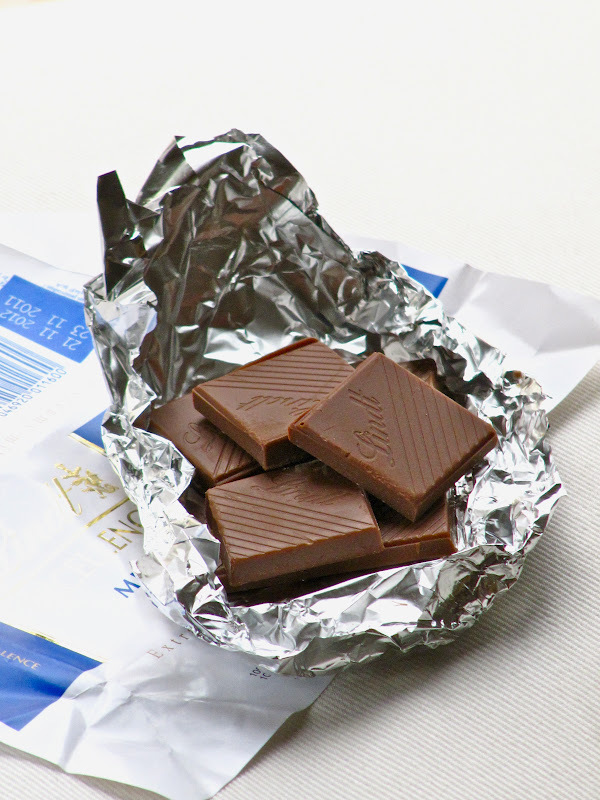 Also play around with dark chocolate, or even white chocolate, instead of milk chocolate. As for fruit varitions, you can do bananas and strawberries this way. Mmm, these are so darn cute and delicious! OMG...What a beautiful post dear...Picture perfect nd tempting. How cool! And using the best chocolate too. How adorable! My son is going to luvvv it! fantastic idea. gonna make this. Ooooohhhhhh!!!!!! lovely and delicious gooey chocolaty. Excellent imagination. Awesome, and they look so adorable, beautiful green with the chocolate..
this looks interesting, and such a posh treat for afternoon tea! I love your ideas, and how I wish you are my neighbour! wow very new and innovative recipe ... yummy !!!!! Am speechless and cant take my eyes from ur clicks..stunning sticks..
Looks yum and delicious. Crops and your picture are stunning. A great idea! Those pops are so pretty. Great clicks. That looks truly amazing!! Love the combination! This is coolest idea!! and i love that bicycle:) and your gorgeous clicks! Oh help me...these look soooo yummy and especially with the Lindt chocolate. 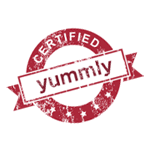 Just found your blog thru foodgawker...love your recipes. I never really thought of trying that or even saw it any blog before. This is such a cool idea and perfect for party too! 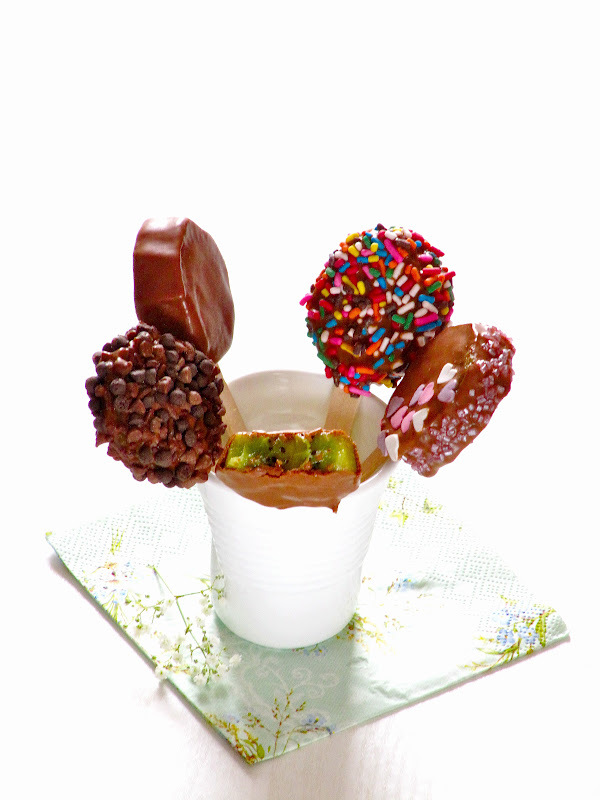 Such a cute idea, you can't go wrong with chocolate and fruit together. Nash, because I am a big fan of your work and your blog, I have a blog award waiting for you on my latest post. Do check it out. 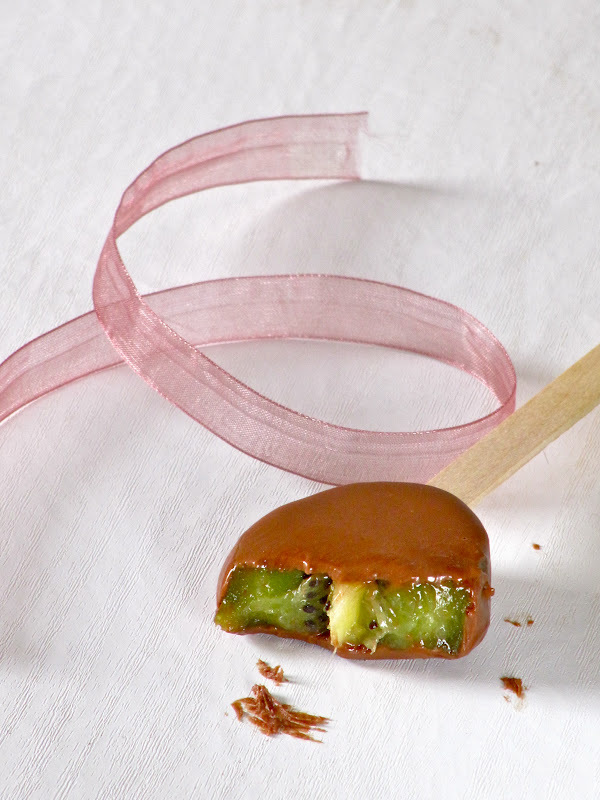 Wait, is it just me who didn't know about chocolate covered kiwis?!?! I'm so trying this recipe as soon as I buy kiwis. 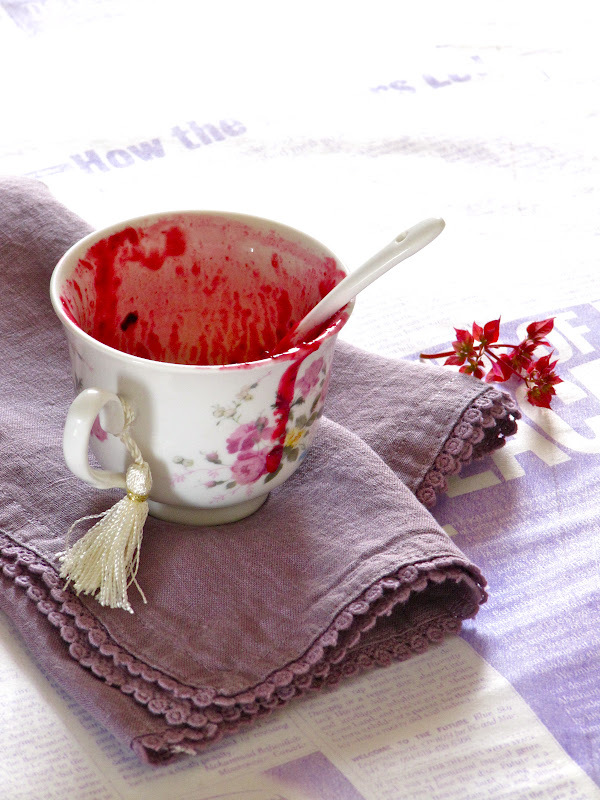 I make only chocolate covered strawberries so this recipe really excites me! I can't wait!!! I can't appreciate you enough for the effort you put in for each your post here. It brings out the woman in you too: patient, loving, and beautiful. Am making melting moments a second time. It's become my idea of a gift to friends now! You are a sweetheart, thanks so much for all the love! Nash, I hope you remember me, I left a comment on your Paneer Butter Masala, and guess what, I made it this morning again, and it came out just perfect! 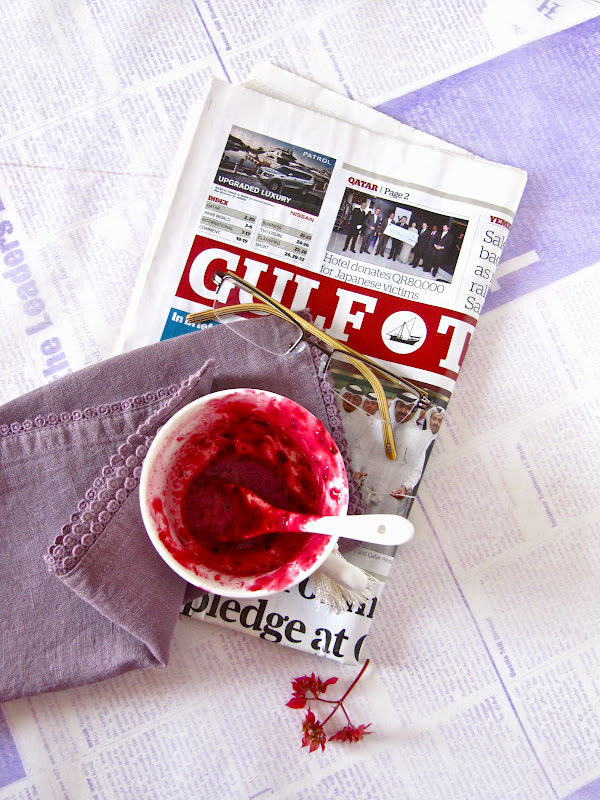 I came to your blog now searching for some meatball recipes, and chanced upon this post, was pleasantly shocked to see the Gulf Times magazine in one of your pics!! Do you live in Doha as well? Will try to catch you on FB so we can link up. Forgot to mention, the drool-worthy pics in this post are absolutely amazing. Huh, did I tell Paneer Butter Masala? I meant butter chicken masala! this is such a great idea...fun ! Yummy! These look incredible :) I wish I could jump in and take a bite! WONDERFUL idea! Move over chocolate covered strawberries! Does the chocolate harden?? I'd be mostly worried about that.. ideas/advice? 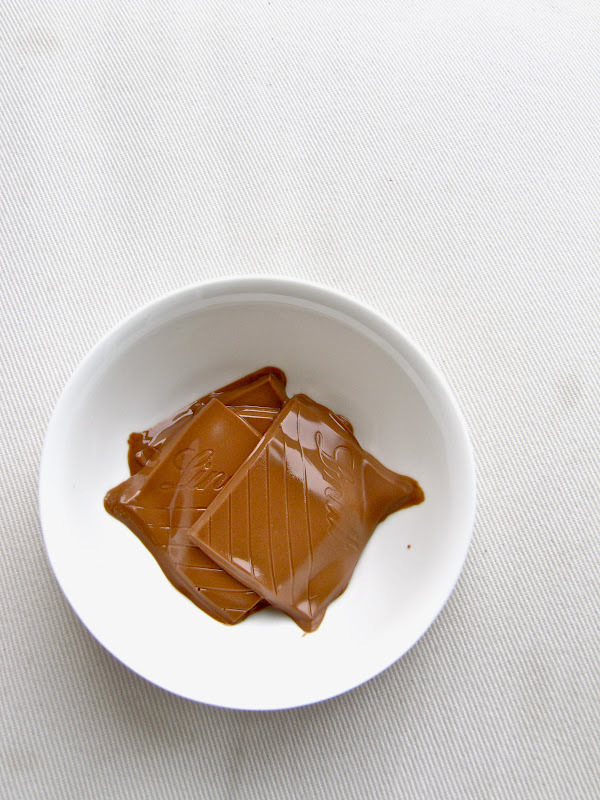 Oh yes, the chocolate hardens fairly quickly once it's melted. 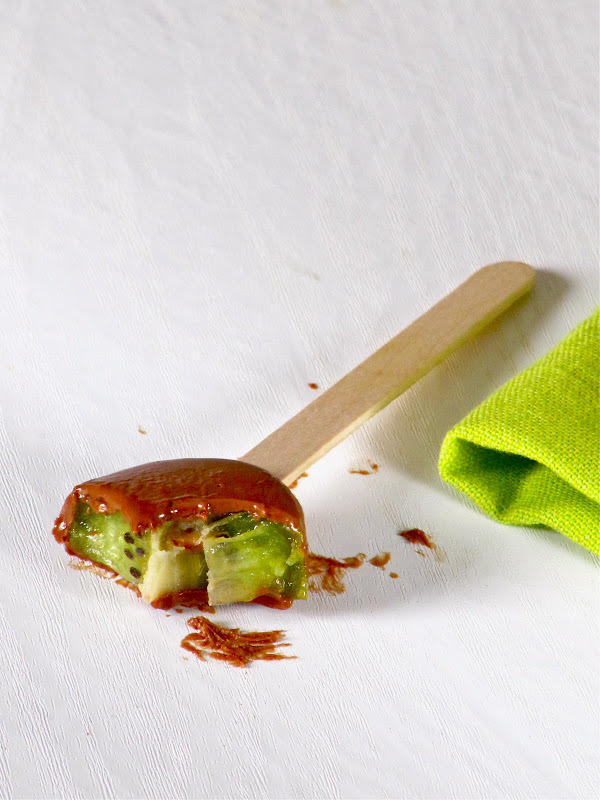 Dipped kiwi will take around 30 minutes to set or harden. Leave it in the fridge to speed up the process. Hope this helps! Oh they look yummy. Only my daughter loves kiwi fruit in our house, so I'm sure she'd relish these. Then again, if I covered it in chocolate I'm sure my son would eat them, too. These would be great for my grandchildren! I couldn't find your Facebook page. 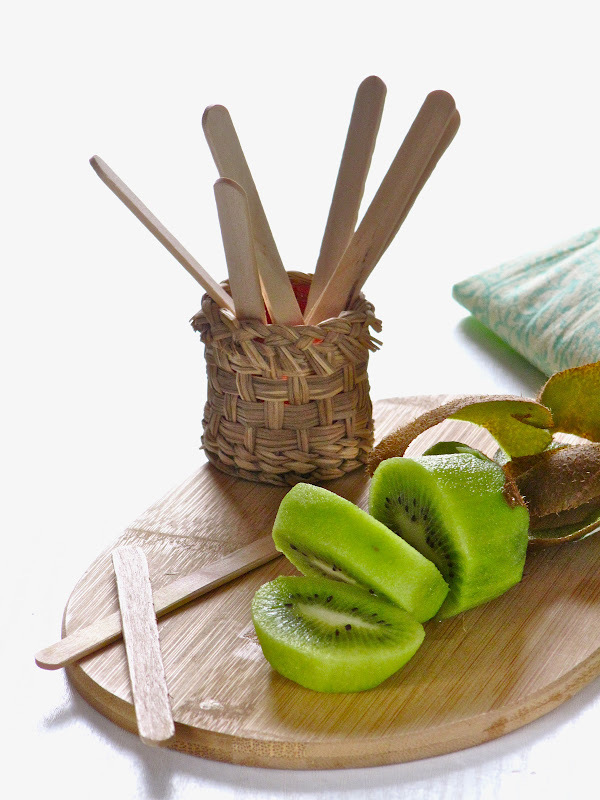 That kiwi pops looks Yummy.